TODAY’S HIGHLIGHTS: Evening transport to the Gran Vía district. Dinner included. Welcome to Madrid! Upon arrival at the airport, we shall be waiting to transfer you to your hotel. Free time. You will receive information about the start of the circuit during the afternoon, or you can check the informative panels in the hotel reception area. Towards the end of the day, we provide transfers to the Egyptian Debod temple, Plaza de Es­paña and Gran Via; a vibrant district . Indian dinner is included. TODAY’S HIGHLIGHTS: Madrid city tour. Visit to the Plaza de Toros de las Ventas bullring. Stroll through the Retiro Park. Dinner included. This morning, experience the city on a guided tour, which showcases the city’s vibrant centre, the beautiful Plaza Mayor (Main Square), its broad and magnificent avenues, its many fountains and a walking tour of the beautiful Retiro Park, enhanced by the lake and Crystal Palace. Our tour includes a visit to see inside the Plaza de Toros de las Ventas, a fine-looking building. Here we learn about the tradition of “corridas” in the Bullfighting Museum. Enjoy the rest of the afternoon. 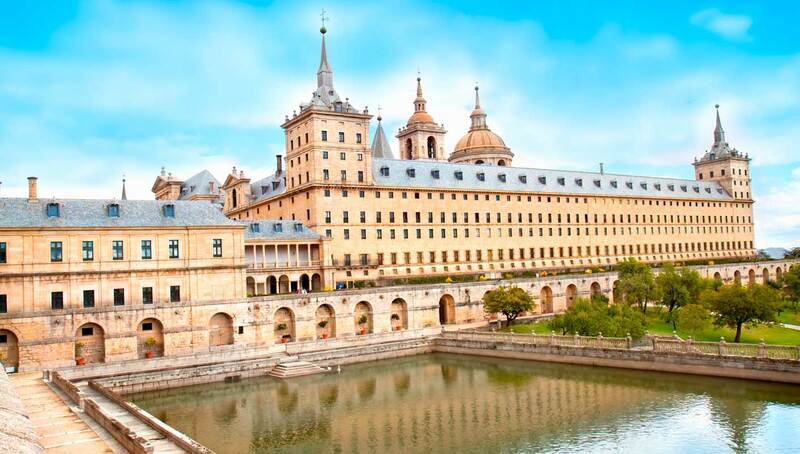 At sunset we provide transfers to the Plaza de Oriente in the historic centre of Madrid, opposite the Royal Palace. Vegetarian or Indian dinner is included. Return to hotel. TODAY’S HIGHLIGHTS: Barcelona city tour. “Spanish Village” visit and evening transfer to Las Ramblas district. Indian dinner included.Today we will get to know Barcelona, an impressive city right on the Medi­terranean Sea. Our visit includes an informative city tour with a local expert (note: If the group has fewer than fifteen people, explanations can be given by our guide.) We also visit the city’s historic central area with its Gothic neigh­bourhood dating back to the Middle Ages. We will visit the area where the Olympic Games took place. It will be possible to see and photograph La Sagrada Fa­milia basilica; the masterpiece designed by the architect Gaudí. Subsequently, we include the entry ticket to “Poble Espanyol” (meaning “Spanish Village”). This open air architectural museum is situated in one of the most emblematic areas of Barcelona. Be delighted by the best Spanish craftsmanship and discover the architectural styles, traditions and folklore of the different communities in Spain. Free time to explore the city on your own. In the evening we provide transfer to Las Ramblas and Plaza Cata­lunya area, Indian dinner included. Return to hotel. TODAYS HIGHLIGHTS: Visit Peniscola, a beautiful walled town combined with a castle on the sea. Sighseeing of Valencia. Evening transfer. Dinner included. We travel south along the Mediterranean. A special stop is made at PENISCOLA, a small walled town on the shores of the sea. After a short introduction given by our guide, you can make your way through the town, discovering the fishing port, the castle and the beach. Time for a walk. Afterwards we travel to VALENCIA, time for lunch. In the afternoon, with a local guide we will include a visit to the third largest Spanish city that mixes the modern with the historical. We will know its historic center, the fish market, the cathedral and also the avant-garde City of Arts and Sciences. the most important modern tourist site in the city. Evening transfer to the Plaza de Toros. In this area an indian or vegetarian dinner will be included. Return to hotel. TODAYS HIGHLIGHTS: Tourist train in Caravaca. We continue through the community of Valencia. ALICANTE. Time to stroll in this active and very pleasant city by the sea. After lunch we go on our way to the Murcia region, where we will see CARAVACA DE LA CRUZ, A town considered by the Catholic Church as one of the 5 holy cities, its church holds a relic of Christ’s Cross. We include a ride up to the historic area on the tourist train. After this we will carry on along an attractive scenic road to ANDALUSIA. Arrival at the end of the day in GRANADA. TODAY’S HIGHLIGHTS : Visit to the Alhambra. Night transfer. Dinner included. A full day in GRANADA and tour (including entrance and local guide) of the immense Alhambra Palace and its beautiful Generalife gardens built in Arab times. Time for lunch. Free afternoon to see the Cathedral with the sepulchre of the Catholic Kings. Later, enjoy an evening transfer to the Albaicín of Granada, a World Heritage site along with the Alhambra, where you can enjoy dinner in a restaurant in the narrow winding streets of this captivating Medieval Moorish quarter. Dinner included (vegatarian or Indian) Tonight you have the option to attend a flamenco dance show and the traditional neighborhood of Sac­ramonte.Note: in the Alhambra complex, the Nazari palaces allow a limited number of people in at a time. Sometimes your visit may be in the afternoon, depending on the timetables in which we are allowed in. In the highly improbable case of not being able to visit this area of the Alhambra, a visit to the Alcázares will be included in Seville (which have similar architecture and features). TODAY’S HIGHLIGHTS: we will see the beautiful Andalusian village of Ronda. We leave Granada and travel towards the Costa del Sol. MALAGA, arrival and time for a stroll in the historic centre with its cathedral and the Picasso Museum. After this we will continue along the coastal motorway with beautiful views of the Mediterranean. PUERTO BANUS, in Marbella, a pretty high level recreational port. In the afternoon we will continue through the hills and their stories of bandoliers until we come to RONDA, a very beautiful white town with its large gorge that divides it in two. Continuation to SEVILLE. Arrival at the end of the afternoon. TODAY’S HIGHLIGHTS: Guided visit with local expert in Seville. Boat trip along the river Guadalquivir. Night transfer to the historic city centre. Dinner included. After breakfast, a local expert guides you through a scenic visit of Seville featuring the Cathedral and its famous Giralda, the banks of the Guadalquivir River, popu­lar neighborhoods of Santa Cruz and Triana and the beautiful Plaza de España. (note: If the group is fewer than fifteen travellers, it can be arranged in both Spanish and English). After the tour, we will include a boat trip along the river Guadalquivir, enjoying the panoramic views from the boat. Enjoy leisure time straight afterwards. At the end of the afternoon, we will go to the historic city centre area (Calle Alfonso XII). Dinner, indian or vegetarian included. TODAY’S HIGHLIGHTS: Entrance in the Carabelas Museum were Christopher Columbus started his voyage to America. Chapel of the bones in Evora. We leave Seville and in the province of Huelva, we travel to PALOS DE LA FRONTERA. We include entrance to the Carabelas Museum; this is where Columbus set sail on 3 August 1492 for America. We will see the Rabida Monastery, declared a World Heritage site, a Franciscan monastery strongly linked to the history of the discovery (entrance included). After this we will travel to Portugal. MERTOLA, a stop in this ancient Muslim city, its present church was a mosque, and time for lunch. After this, through white villages we come to EVORA city declared a World Heritage site with its wide streets, its Renaissance policies and its cathedral, we will include the entrance to the impressive Chapel of Bones, built with 5000 skeletons! LISBON, arrival at the end of the day. TODAY’S HIGHLIGHTS: Visit Lisbon. Transfer to Restauradores Square. Dinner included. In the morning we have a sightseeing tour with a local guide (note: Ex­planations may be given by our guide if the group has fewer than twelve people). We visit tra­ditional neighborhoods, which take in the Belem district, which is the birthplace of the great Portuguese navigators who sailed the oceans in the Fifteenth Century. We shall look round the Monument to the Discoveries, Belem Tower, and the beautiful Jeronimos Monastery, a UNESCO World Heritage Site. The afternoon is free so that you can explore this great city independently. At the end of the afternoon, we include transportation to Restauradores Square , full of atmosphere with its bars and cafes from where we suggest you to take the "Elevador da Gloria" that brings you to the Upper district and its viewpoint. Indian or vegetarian dinner included.